Both ornamental and edible ginger plants add attractive foliage to the garden. Edible ginger is grown for its ornamental features, as well as for its edible roots, or rhizomes, while ornamental ginger is prized for its colorful floral bracts. 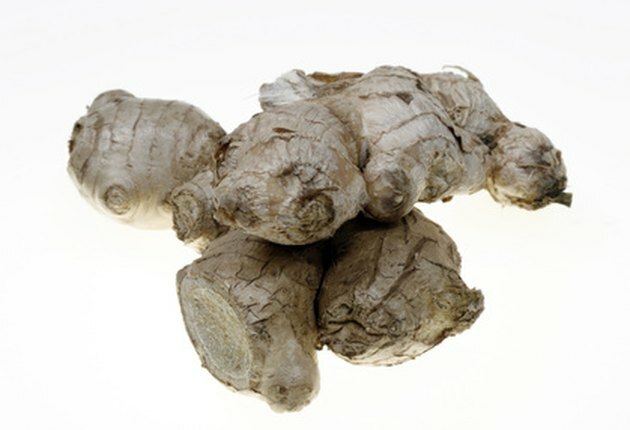 Ginger is grown from rhizomes, or enlarged roots, regardless of the variety. Whether you are dividing the roots of a crowded plant colony, planting a new plant or moving an existing plant to a new area, proper transplanting is necessary so that the ginger continues to thrive in the garden. Edible ginger roots grow into attractive garden plants. Loosen the soil around the ginger plant with a spading fork if you are transplanting it to a new bed or dividing it. Lift the ginger rhizomes out of the soil, leaving any foliage in place. If you are dividing the plant, cut 1- to 2-inch-long pieces of the rhizomes from the outside of the root system, cutting the pieces so that they have at least one bud on them. Leave the rest of the plant in the ground. Prepare a partially to fully shaded garden bed for the ginger. Apply a 2-inch layer of compost over the planting area and work it into the top 6 inches of soil. Plant the ginger rhizomes at a 1-inch depth. Space additional plants 15 inches apart in all directions. Sow the rhizome so that the bud or foliage is on the top. Water the bed thoroughly after transplanting, moistening it to a 6-inch depth. Spread a 1- to 2-inch mulch layer over the bed to help preserve soil moisture between waterings.